Harbin Cultural Island is the latest addition to Ma Yansong's list of Shan-Shui city concepts slated for an island surrounded by the wetlands of Songhua river in Northern China. The collection of buildings that make up the center blend seamlessly amongst their snowy environment thanks to the use of white stone and cement building materials, as well as a layer of white aluminum. Covering an area of 1.8 square kilometers, with a construction area of 79,000 square meters, the structure has a distinct glacial outline against its wide riverbank background. But this imposing visage is strikingly different up close; find out why after the jump. 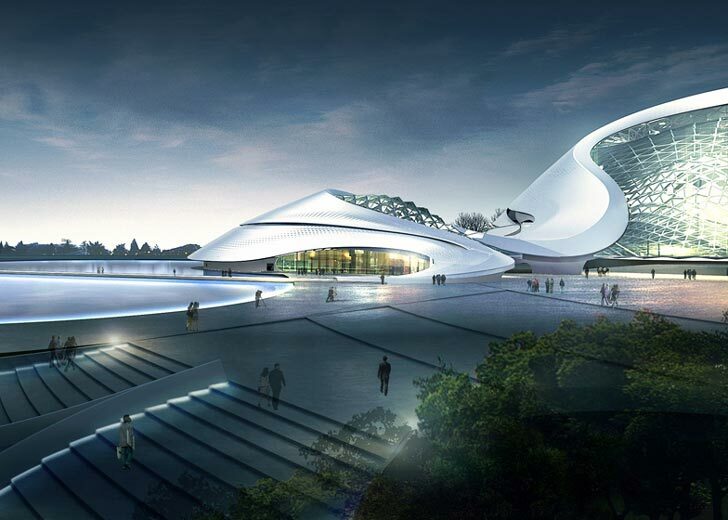 On closer inspection the building has a smooth undulating form that echoes the course of the river through the surrounding terrain, a feature that strategically directs the flow of people to the entrance of the Harbin Theater and Harbin Labor Recreation Center. The external ramp of the Grand Theatre resembles a mountain path formed by gusting winds, guiding people from the interior to the exterior. At its highest point, visitors will also be able to enjoy panoramic views of the expansive landscape, as if they were standing at the peak of a mountain. 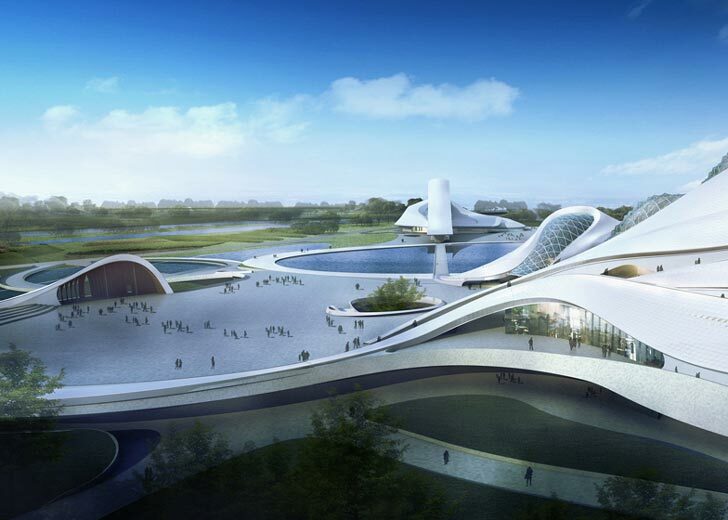 Comprised of the Harbin Theater, Harbin Labor Recreation Center, Harbin Great Square and the Wetland Park, the Cultural Island aims to integrate culture, art, and nature as one. It was in February 2010 that MAD won a competition to design this iconic project, which has been described as a continuation of the human spirit. Drawing on the reputation Harbin has as the music capital of the North, the project is expected to be finished in 2014 – just in time for the start of the Harbin July summer concert. The collection of buildings that make up the center blend seamlessly amongst their snowy environment thanks to the design team's careful interventions. Covering an area of 1.8 square kilometres, with a construction area of 79,000 square meters, the structure has a distinct glacial outline against its wide riverbank background. On closer inspection the building has a smooth undulating form that echoes the course of the river through the surrounding terrain, a feature that strategically directs the flow of people to the entrance of the Harbin Theater and Harbin Labor Recreation Center. The external ramp of the Grand Theatre resembles a mountain path formed by gusting winds, guiding people from the interior to the exterior. The interior is filled with plenty of natural light. Comprised of the Harbin Theater, Harbin Labour Recreation Center, Harbin Great Square and the Wetland Park, the Cultural Island aims to integrate culture, art, and nature as one. MAD won a competition in 2010 to design this iconic project described as a continuation of the human spirit. Drawing on the reputation Harbin has as the music capital of the North, the project is expected to be finished in 2014, just in time for the start of the Harbin July summer concert. At its highest point, visitors will also be able to enjoy panoramic views of the expansive landscape - as if they were standing at the peak of a mountain.